Research undeniably proves that the Veil of Manoppello comes from Jerusalem. The consolidation of the Countenance's image took place in the tomb of Jesus at the moment of His Resurrection. It is highly probable that both the Shroud of Turin and the Veil of Veronica traveled to Edessa and were kept there until the 5th century. The oldest legend, so called Kamulian, dating from the 6th century, mentions that the image of Christ's face arrived in Constantinople in 574 AD from a small place called Kamuliana, located close to Edessa. 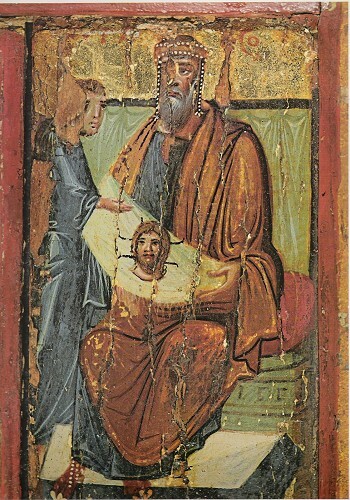 A sixth-century text from Tbilisi reads that after the Ascension of Jesus His Mother kept the image, which was created in His tomb, on a piece of cloth. She is said to have received the image from God the Father so that she could pray looking at the face of her Son. Another legend which has been used to explain the creation of Christ's Countenance's miraculous imprint mentions Abgar, the king of Edessa. He developed leprosy and, sending his messenger Ananias, asked Jesus to come to Edessa to cure him. Jesus was not able to go but He sent Abgar a letter [in which He praised the ruler's faith] and the veil with the image of His Countenance [imprinted on a piece of cloth used for drying His Face after washing]. When Abgar saw the Divine Countenance of Jesus imprinted upon the veil [or reverently pressed it to his face], he was healed [partially and received complete healing upon the arrival of St Thaddeus, promised by Jesus in the letter to Abgar]. The legend talking about Veronica who wiped the face of Jesus when He carried His cross to Golgotha was most likely coined in the Middle Ages and was yet another attempt at explaining how the miraculous image had been created. However, no traces of blood were ever found on the Veil and no Veronica existed at that time. When the Veil of St. Veronica is mentioned, one must remember that it is just a reference to the veil from the tomb of Jesus, since the name 'Veronica' comes from a Latin and Greek blend of words vera and eikon, standing for a true image. The Veil of Veronica reached Rome in the 8th century and was kept in St. Veronica's Chapel in St. Peter's Basilica. In 753 AD a note was made in the papal annals stating that during a solemn procession Pope Stephen II, walking barefoot, carried the Imprint of Christ's Countenance which had not been painted by man. This relic was called either the first icon or the Kamulian Shroud or the Imprint of Edessa. Everybody was convinced that the imprint had not been painted by man therefore it was called acheiropoietos, meaning not made by hand. It was undoubtedly the best-known relic kept in St. Peter's Basilica. The Veil of Veronica attracted crowds of pilgrims to Rome who were easily distinguished by little pictures presenting the Divine Countenance from the Veil. In 1208 AD Pope Innocent III introduced the custom of a solemn procession which involved carrying the Veil of Veronica from St. Peter's Basilica to the Church of the Holy Spirit on the first Sunday after Epiphany. The ceremony ended with giving alms to the poorest citizens of Rome  each person got three denarii for wine, bread and meat. In Vita Nuova Dante Alighieri mentions that crowds gathered to gaze upon the imprint of Christ's Countenance on the Veil of St. Veronica. Dante also refers to the Veil of Veronica on numerous occasions in the Divine Comedy, emphasizing that it shows the face of God. However, the climax of the Comedy takes place when in Paradise, the pilgrim faces God who initially manifests Himself as unearthly light, but the face of Christ emerges from the centre of this light. This scene was the inspiration for Pope Benedict XVI to write his first encyclical God is Love. Another famous Italian poet, Francesco Petrarca, also writes about the Countenance of God on the Veil of Veronica in his Familiari canzoniere. St. Brigid of Sweden, who took part in the celebrations of the Jubilee of 1350, mentions the true Image of Christ's Face which was imprinted on the Veil of Veronica. The importance of this relic was demonstrated in 1506 AD when the construction of the new St. Peter's Basilica was begun. A huge column was first erected in the place where the cornerstone had been laid for the Basilica. 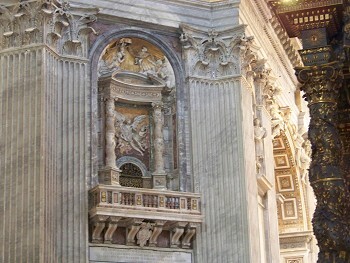 The column held the most important vault of the Vatican, intended for keeping the True Countenance of Christ. To this day, the column, called St. Veronica of Jerusalem, is inscribed with Latin words saying, In order to honour with dignity the majesty of the Saviour's Countenance, imprinted on the Veil of Veronica, Pope Urban VIII built and adorned this place in the Jubilee year of 1525. For many years professor Heinrich Pfeiffer of the Gregorian University has studied all the issues connected with the Veil of Veronica on the basis of history of art and the oldest Chrisitan sources. His study has shown that the image from Manoppello is the archetype for all the pictures presenting the Countenance of Christ. Professor was inspired to undertake his search by the revelations of Sister Blandina Paschalis Schlomer, a German Trappist and icon-painter, who after many years of meticulous research proved that the face from the Veil of Manoppello perfectly matches the imprint of the face on the Turin Shroud. All the official copies of the Veil of Veronica from the 15th century and earlier present the same face of Jesus with open eyes, hair, a beard, a distinct nose, covered ears and a neck. Veronica was portrayed by the greatest European painters such as Jan van Eyck, Hans Memling, Robert Camping, Andrea Mantegna and Dirk Bouts. Until the beginning of the 17th century all great master painters had portrayed Christ with open eyes, using as a model the same Countenance of God which is now found in Manoppello. Even in 1618 and 1620 the title page of printed copies of Opusculum de Sacrosanto Veronicae Sudario by Jacop Grimaldi, who had been commissioned by the Pope to take detailed inventory of St. Peter's Basilica's treasures, presented the Countenance of God from the Veil of Veronica. It was the same Countenance as the one visible on the pictures painted until that time. However, the copy of Opusculum from 1635 presents a completely different Countenance of Christ, i.e. with closed eyes. A major turning point in portraying Christ occured after Pope Urban VIII had consecrated the newly built St. Peter's Basilica in 1626. At that time the image of living Christ's face was replaced with the portaits of dead Christ with closed eyes. After 1620 a true revolution started in Christian iconography. In his book The Countenance of God. The Veil of Manoppello Paul Badde claims that around that time the authentic Veil of Veronica was stolen from St. Peter's Basilica and replaced with a veil presenting the image of dead Christ's face. The Veil had been stored in St. Peter's Basilica since 8th century AD and at the beginning of 1616 the news of the Veil's disappearance was spread. It is assumed that Pope Paul V held the authentic Veil of Veronica for the last time during a solemn procession on 25th January 1606. But was it still the authentic Veil? In 1617 Pope V forbade making any copies of the Veil of Veronica without the Holy See's permission and authorization. 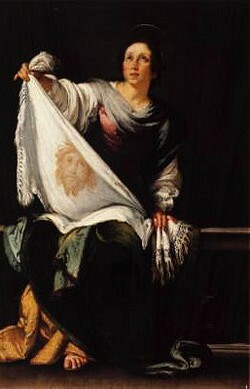 Some historians believe that the Veil may have been stolen much earlier. For when the army of Charles V captured Rome on 14th May 1527, Pope Urban V sent a letter to the Duchess of Orvieto in which he informed her that in St. Peter's Basilica 500 men hed been slain in front of the altar, some relics had been dispersed and others burnt. Other historians claim that the Veil was stolen and moved among Rome's taverns while nobody realized it was the Veil of Veronica. German historians Gustaw Droysen and Ludwig von Pastor confirm this in History of the Popes [From the Close of the Middle Ages]. In 1528 Pope Clement VII issued a special command to recover all the stolen relics and bring them back to St. Peter's Basilica. During a solemn procession on 26th November 1528 the recovered relics were carried from the St. Mark's church to St. Peter's Basilica. It was not difficult to plant a fake veil among many relics. However, it is not clear when the authentic Veil of Veronica disappeared from St. Peter's Basilica: whether this happened during the capture of Rome in 1527 or at the beginning of the 17th century. In the treasury of St. Peter's Basilica there is an old Venetian frame with two broken crystal panes in which the Veil was stored from the 16th until the 17th century. The Veil of Manoppello fits the frame perfectly. Paul Badde points to the fact that there is a large crystal chip in the bottom right corner of the Veil's frame. It is an undeniable proof of the fact that the panes were broken and the priceless relic was stolen. Paul Badde held a journalist inquiry on the basis of long-term research conducted by German scientists, i.e. professors Pfeiffer, Resch, and Thiermeyer as well as that of Sister Blandina. His investigation led to a revelation that a church in Manoppello was the location of the Veil of Veronica, which had been stolen from Rome in mysterious circumstances in 1608 during the construction of the new St. Peter's Basilica. Professor Pfeiffer is convinced that the image of God's Countenance was imprinted on the Veil in Christ's tomb during His Ressurection. 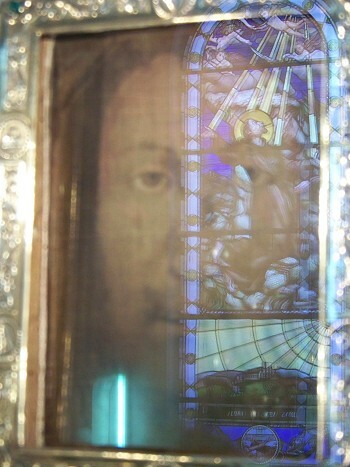 The Veil was placed on the Shroud in the area of the face. The negative of the Dead Christ was fixed on the Turin Shroud while the positive of the Resurrected Christ was imprinted on the Veil. 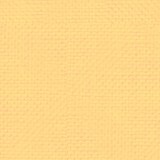 When you compare the Countenance from the Turin Shroud with the Countenance of Manoppello you can notice a perfect match. 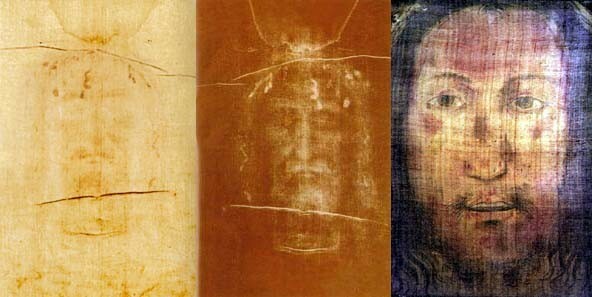 It is the same face and it may be assumed that the images on the Veil and the Shroud were created during the Resurrection of Christ. 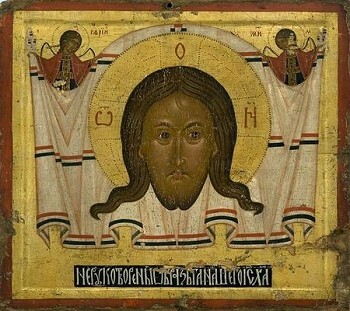 These are the only images of Christ's Countenance in the world which were not made by hand, so called acheiropoietos. In 1645 Donato da Bomba, a Capuchin, wrote the history of the miraculous image of the Christ's Countenance of Manoppello. 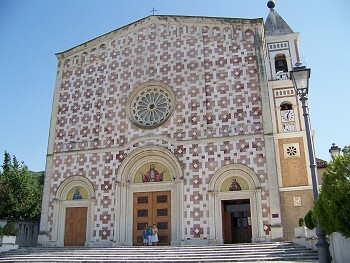 The manuscript has been stored in the archives of the Capuchin province in L'Aquila. Upon reading it one may find out that Antonio Leonelli, M. D., lived in Manoppello in 1506. One day he and his friends were standing on the square in front of the church. At one moment an unknown pilgrim came up to them and asked the doctor to follow him to the church as he wanted to pass something very important to him. In the church the pilgrim handed the doctor a bundle. When Leonelli opened it, he saw a beautiful image of the Christ's Countenance. However, when he wanted to thank the pilgrim and invite him to his house, he realized that the pilgrim had vanished without a trace. Any attempts at finding the pilgrim in the town and the area were ineffective. 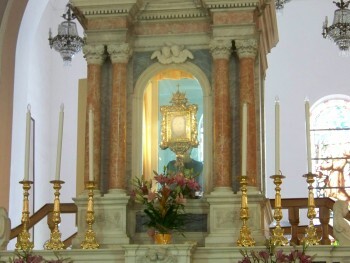 Therefore in his house Leonelli built an altar in which he placed the miraculous image of Christ's Countenance in order to protect it from theft. He and his family prayed in front of the image everyday. When the doctor died, his relatives argued for many years how to divide the property he left. One of his relatives, Pancrazio Petrucci, a soldier, broke into Leonelli's house and stole the priceless image. When a few years later Pancrazio ended up in jail in Chieti and needed money to pay a fine, he asked his wife to sell the image. It was bought by Antonio De Fabritiis from Manoppello. He followed an inner impulse and passed the priceless relic to Capuchins in 1638 so that all the faithful could have access to it and worship it in the parish church in Manoppello. In 1750 the Capuchins decided that the Divine Countenance would be celebrated each year on the third Sunday of May. Nevertheless, Professor Pfeiffer questions the credibility of this story. He claims that the Veil of Veronica in fact reached Manoppello not before the beginning of the 17th century and the story had been made up in order to mislead the Holy See which had been searching for the lost relic. How the image had traveled through time before it got to Manoppello remains a mystery. It is impossible to decisively determine whether the image was stolen from St. Peter's Basilica in the 16th or the 17th century. Yet all the people of goodwill will continue to treat it as the most precious relic of Christianity along with the Turin Shroud. 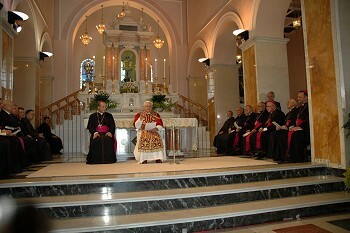 Bruno Forte, a famous theologian and the archbishop of Chieti diocese, proclaimed the year 2006 as the Year of the Great Jubilee of the Divine Countenance sanctuary in Manoppello. 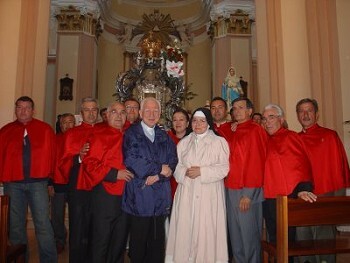 On 1st September 2006 Pope Benedict XVI visited Manoppello. More and more faithful come to Manoppello to worship the Saviour and to feel His gaze so full of love. 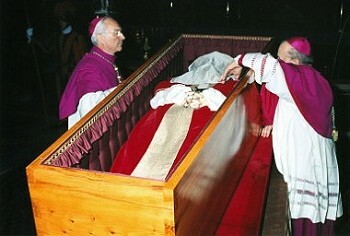 Archbishop Piero Marini, the Master of Pontifical Liturgical Celebrations, and archbishop Stanisław Dziwisz, the Pope's Private Secretary, covered the face of the late John Paul II with a white funeral veil. Before he died John Paul II altered the funeral ceremony for the Popes and introduced the custom of covering their faces with a veil.